We have recently rewritten our spray painting simulation, we now have a more realistic spraying system that has wet paint that dries over time, metallic paints and the collection of Ironlak spray cans. Choose from 5 highly detailed and polished areas to spray in, or pick one of the many sandbox locations included. Jump in with your crew with our multiplayer mode. Spray collaboratively with up to four players at once from anywhere in the world! Our replay system lets you play your artwork from the very first brush, sit back and watch your avatar playback what you have sprayed. Share playbacks with friends to show off your skills or help teach people your techniques. The Director System in Kingspray allows you to present your work in a cinematic and interesting way for viewers. The automated camera cutting system will sweep through views of each environment, tracking you as you work, even during replays! This feature allows you to drop in your own images, use them as reference or project them onto the paint surface. So even if you are not the best artist in the world you can still create some awesome pieces to impress your friends. Take high quality 360 panormic captures to share on social media. 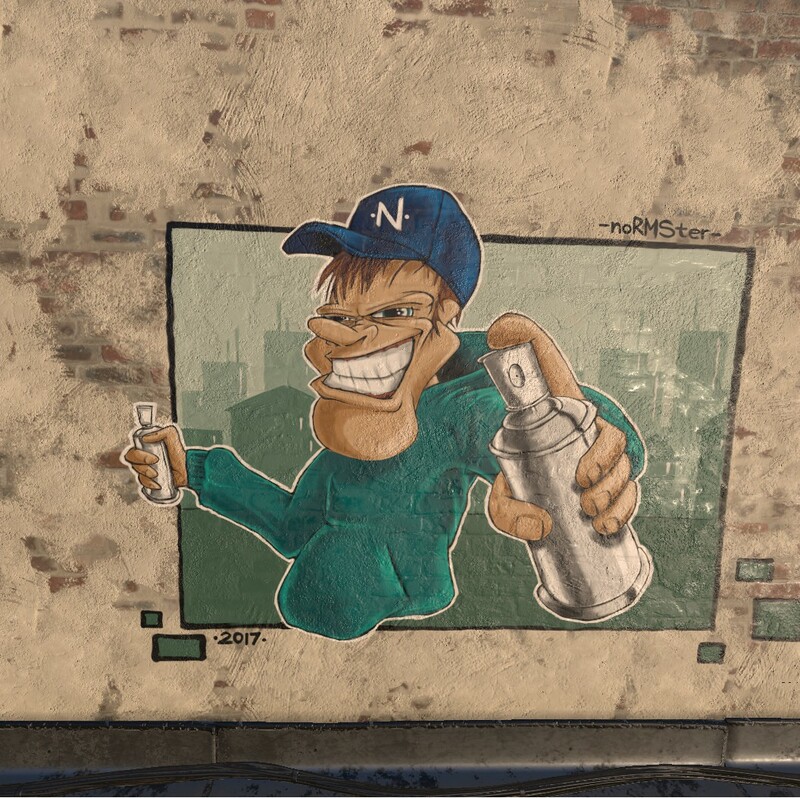 Kingspray Graffiti VR is available for both Oculus Rift with Touch controllers and the HTC Vive. Pick from one of the five high detailed environments to spray in. We also have “The Lab’ experiments where you get to paint on vehicles and different wall surfaces. This Multiplayer VR painting experience uses state-of-the art Motion Controllers, comes with realistic surfaces, spray and drip effects, UNrealistic Undo/Redo, and you can spray collaboratively with up to four players at once from anywhere in the world! We now have a large collection of real-world Ironlak spray cans in the game. Send us your query using the form below and we will get back to you as soon as we can. Smooth, easy UI. Awesome, well-chosen soundtracks – including awesome trip-hop selections. Beautiful stylings. Very good palette of preselected colors in addition to the color-picker. Three types of cap. Multiple beautiful locations. Objects in the world you can interact with. Very, very convincing brick texture which holds up to parallax perspective. A phone with which you can snap pictures, control the music, and manage the settings. This has been my best VR experience so far. Highly recommended. I didn’t have to drop money on paint, fix a piece after tagger scum or run from security. Yet to check multiplayer out, having too much fun in single player. Awesome game. This was one of the two games that made me buy VR. Always wanted something that could make pieces the way you do spray painting. Nails it pretty well. There could be touches on spray pattern and such. But overall, took me right back to the days I did graffiti. This is a great little game, it’s one of those games you want to play and relax. Street art that won’t get you arrested.